Our Paramedic Program is 1,110 hours (48 weeks) of classroom activities/labs and clinical internship. You will learn how to take charge at the scene of an emergency and, if necessary, perform life-saving procedures while transporting patients to the hospital. Since paramedics may administer drug and perform certain invasive procedures on patients before they arrive at the emergency department, they are sometimes known as the “hands” of emergency doctors on the scene. In EMS, the majority of calls will fall into either medical or trauma situations. Medical calls usually involve illnesses like heart attacks, severe allergic reactions, labor and delivery and complications from shock. Paramedics can administer a wide variety of medications to soothe patient symptoms until they arrive at the hospital. Trauma calls usually involve an accident or physical injury. Paramedics will respond to the scenes of car crashes, falls, bar fights and sports injuries. In the wake of recent mass shootings emergency services providers are increasingly training with police and other agencies to triage and treat multiple critical patients in dangerous scenes. The paramedic flipped classroom module is just like our EMT flipped program, it’s based on at-home learning for core content, followed by in-class application level activities to reinforce material learned at home. as mention with the EMT program, the evidence from other disciplines report improved student learning in a flipped setting classroom. Upon successful completion of this program, all students will be eligible to take examinations for certification as a Florida State EMT and Nationally Registered Paramedic. 9am – 6pm with a lunch break. Questions About Our Paramedic Program? Registration fee will be due upon application completion. This fee is $150, which will secure your seat in the class. This fee will also be deducted from the total cost of the program. 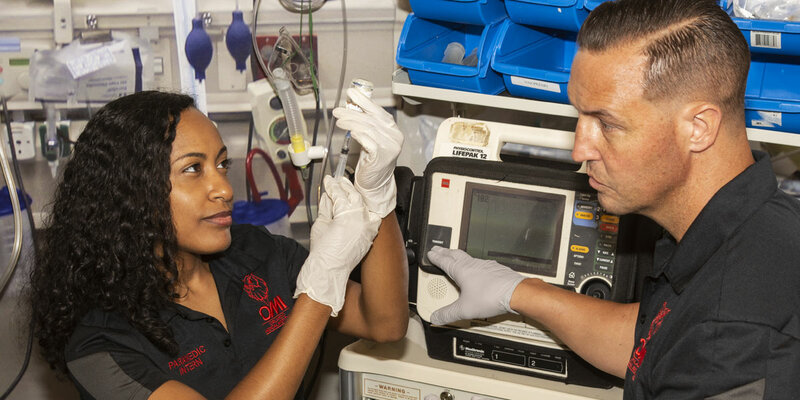 OMI will ensure that the program and the staff are providing the most current instructional theory and practices to our students and meet or exceed the state of Florida and/or National Registry Paramedic certificate requirements. The deadline to register for any of the Paramedic classes will be two weeks from the start date of the course. All of your admission requirements should be turned in, and your initial deposit should be made by this deadline. There is a mandatory orientation class prior to course start date!